We’ve seen in all before. It’s the same but different. 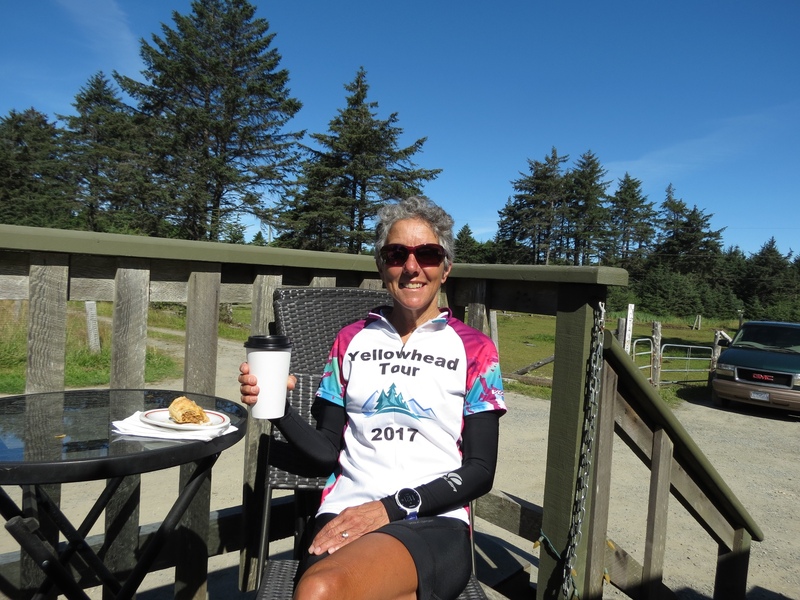 With the ferry ride back from Haida Gwaii our Yellowhead Cycling Tour is officially complete. We have been reunited with our car and are retracing our route east toward home. As we unravel all the miles we just cycled, it inevitably conjures up reflections. 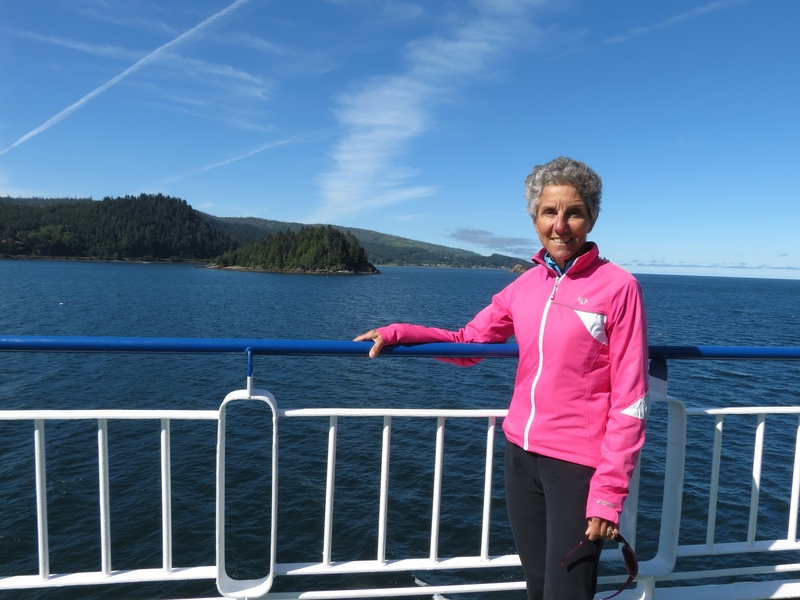 We actually began retracing our route while still on Haida Gwaii. 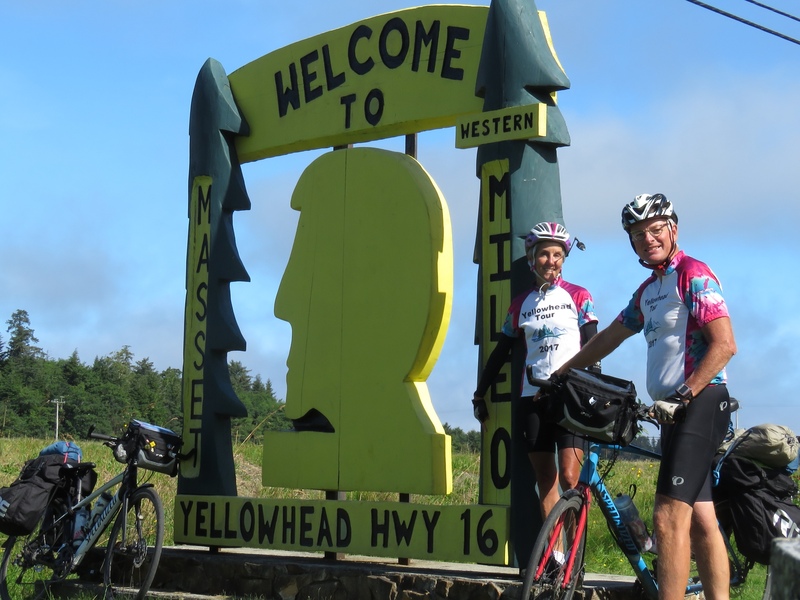 At the top of the island stands a sign marking Mile 0 for the Yellowhead Highway. Completing the highway was a milestone but not the end. We doubled our pleasure on that stretch, returning to our starting point at the ferry landing. 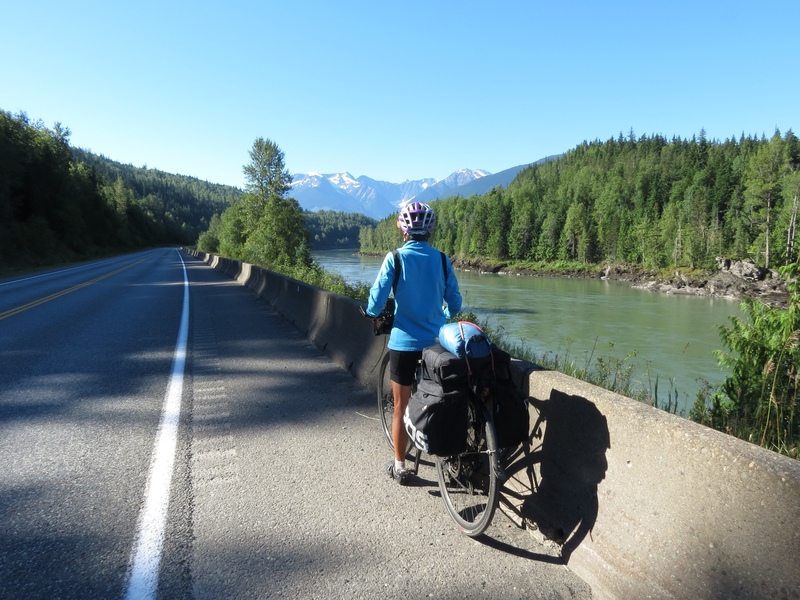 This is the first time we have driven the exact same route that we cycled. 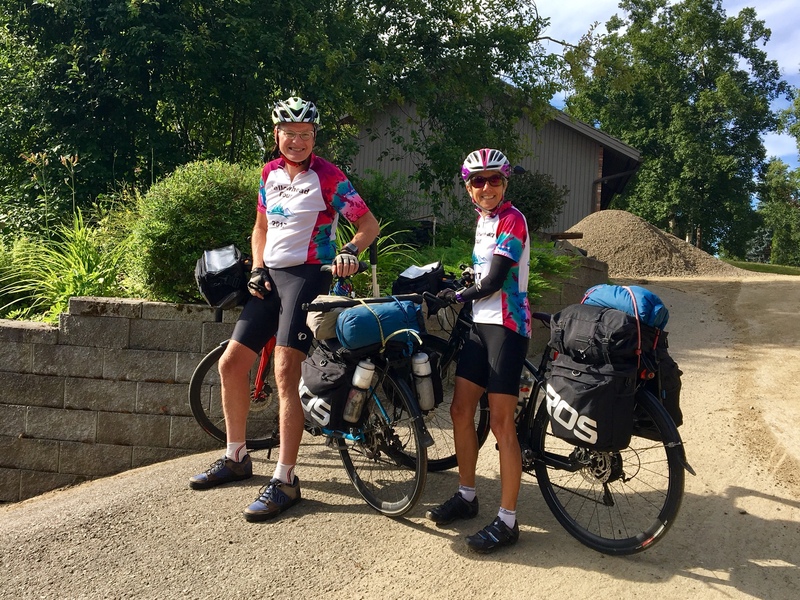 It is an odd sensation, flying over the miles – one hour for each day we spent on our bikes. Our eyes are glued to the road, the sights, the eateries and the lodgings we knew so well at that slower pace. Memories flash by as rapidly as the miles. In the car, we have far more options. We can chose any restaurant we like, even if it is not on our route. And yet, we find ourselves yearning to revisit our favorites. It is surprising to discover just how well we had chosen when limited to venues in close proximity. As we move rapidly eastward, we are reminded of the day by day changes we witnessed in the topography and population density. 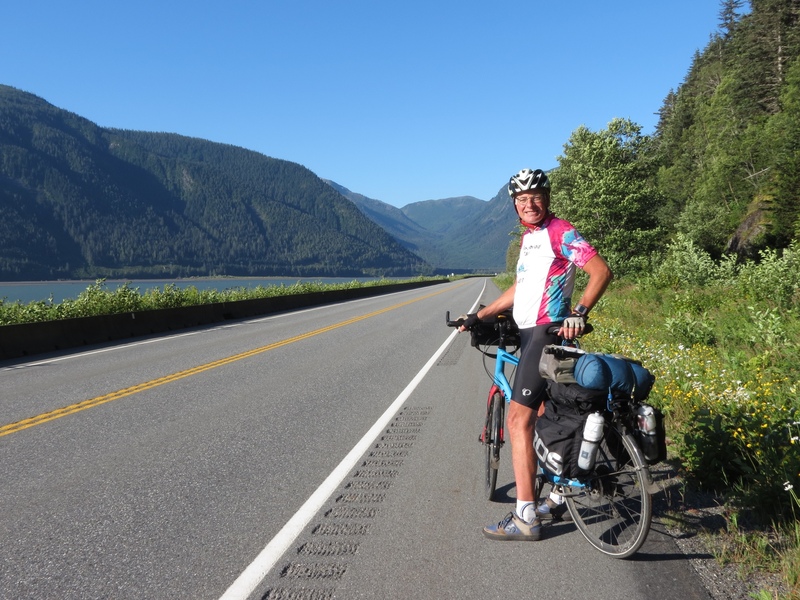 Starting our cycling in Prince George, we endured the congestion, heavy trucks, well worn roads and crumbling shoulders that spill out of a good size city. It was a good two days before we shed that density of civilization. 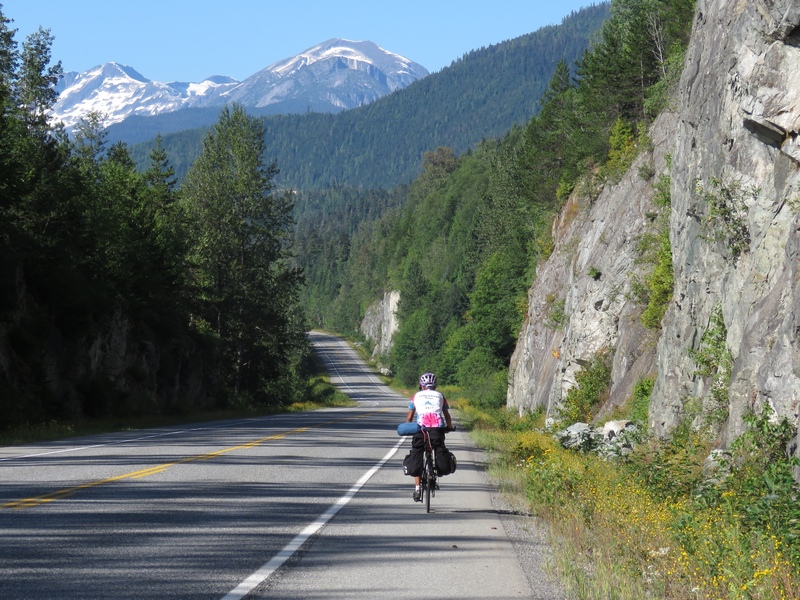 The further west across British Columbia we went, the fewer the people. The more dramatic the scenery. The more remote it became. The better the cycling. The Yellowhead transitioned from busy trans-Canada highway to a quiet link between small communities. It was all so very gradual on our bicycles. The more western section was clearly our favorite. It had all the top features we value on our cycling tours. Water – passing lakes, following rivers. Scenery – mountains and wilderness. Safety – little traffic, good shoulders and pavement. Our finale on Haida Gwaii elevated all that to greater heights. We loved it as much as everyone said we would. And despite the dire warnings of turbulent ferry crossings, we had calm waters in both directions – much to the relief of my sensitive system. The most stark message that comes through is our extreme good fortune with the weather. In the 15 days of cycling, we had a total of 30 minutes with a rain shower. Each day we reveled in the sunshine and clear skies, knowing it was highly unusual and incredibly good weather luck. And that certainly was true. But it was only part of the story. 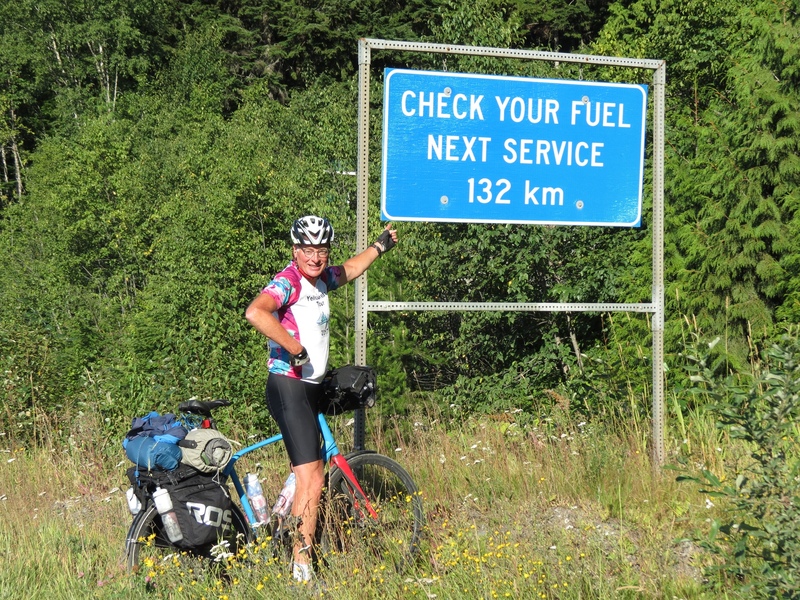 All the while we cycled, wildfires were blazing south of us in BC. 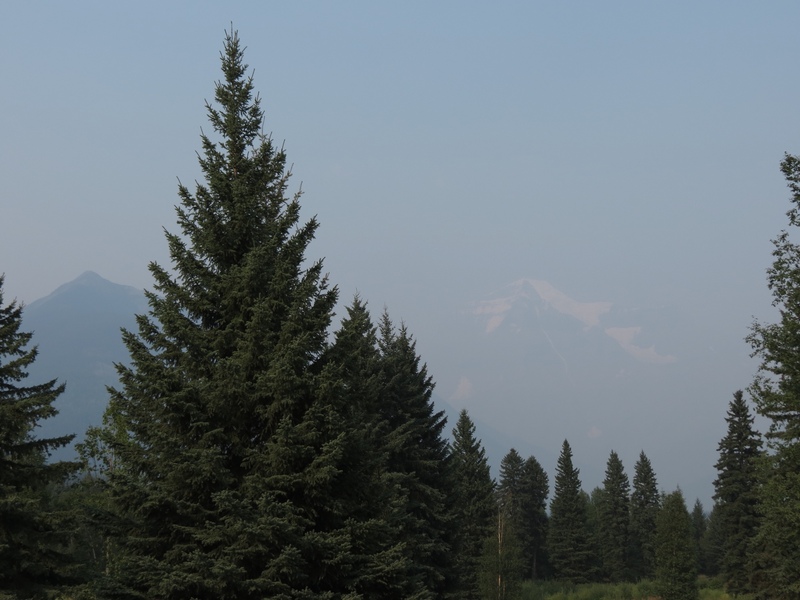 Now, the smoke from those fires blankets the area. The blue sky and unlimited views that we enjoyed are no longer visible. The mountains are dim shadows in the distance, more an idea than a reality. Even the near hills are obscured as if in fog. The air is thick. The sky a uniform opaque white, despite the fact that it is still a “sunny” day. 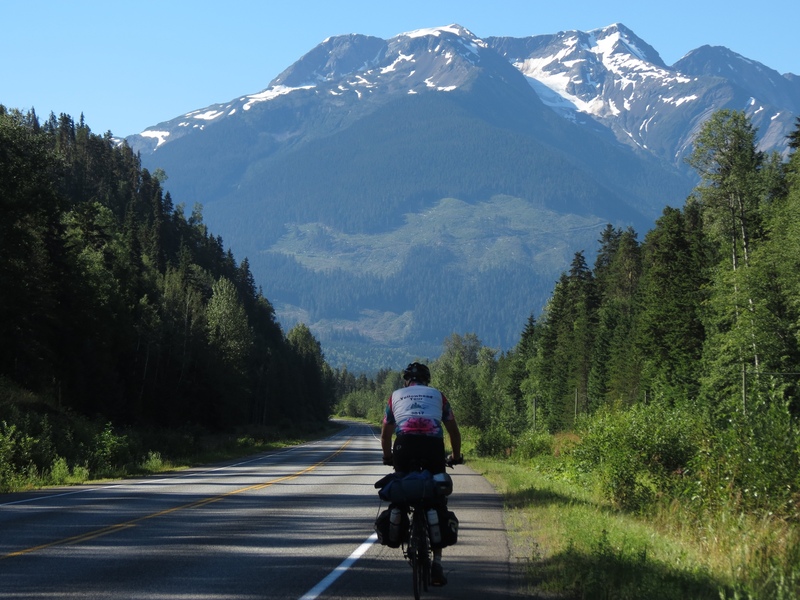 Through a sheer happenstance in timing, we had idyllic conditions for the Yellowhead Tour. It could just as easily have gone the other way. In retrospect, we were blessed. We were able to see God’s creation in all it’s pure glory. The Yellowhead Tour is now history. Another one for the memory books. Tall and symbolic. Colorful and artfully crafted. 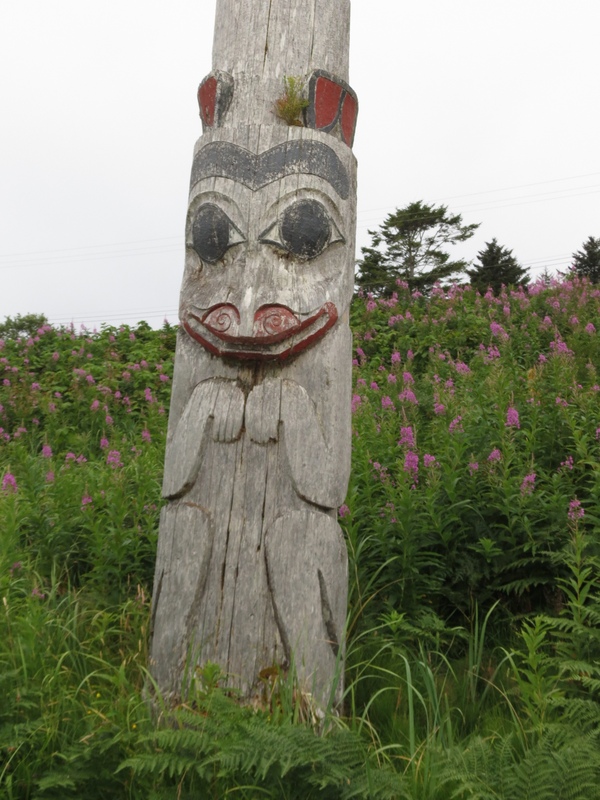 We found carved poles throughout Haida Gwaii, the most frequent reminder of the Haida culture. 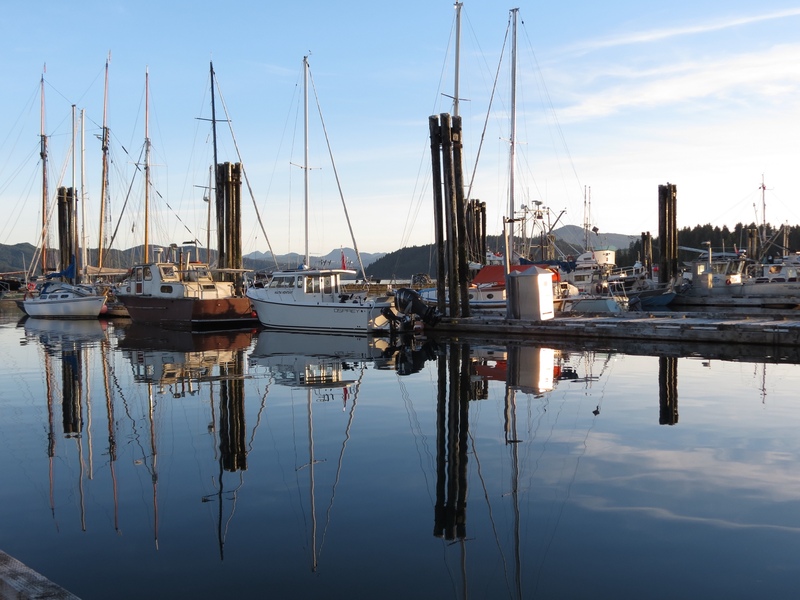 To visit the islands is to be steeped in the heritage of the Haida Nation. This is what sets it apart from any other group of beautiful islands. Throughout their history, the Haida have been known for their art. Blessed with a temperate climate and bountiful resources, they had the benefit of time to invest in developing their crafts. 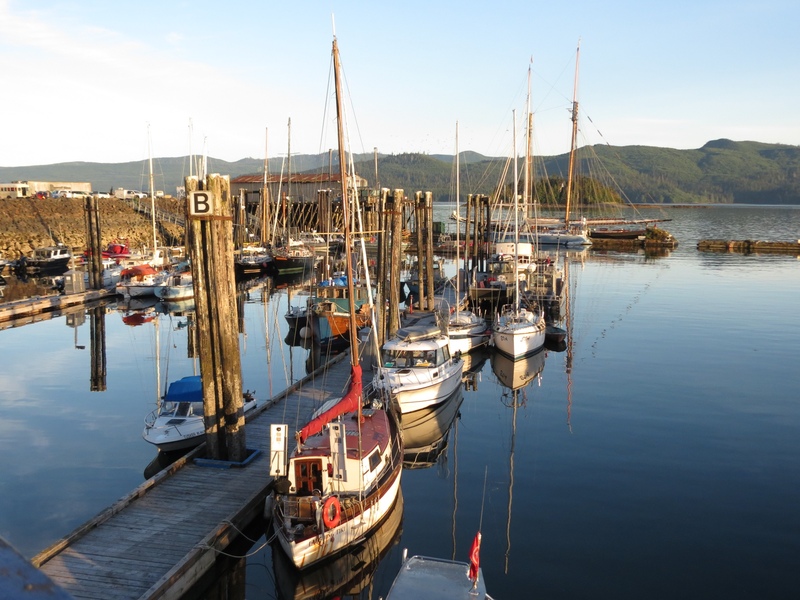 Today the Haida populations are concentrated in Skidegate in the south, and Masset to the north. In those commmunities we found visible artistic expression on display. 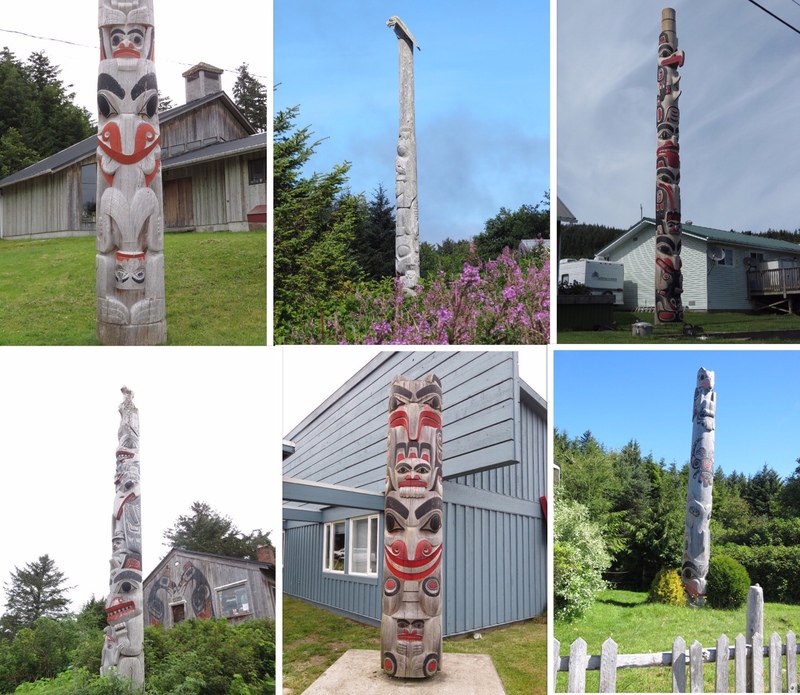 Haida poles appeared just about anywhere in town – front yards, community buildings, signs, and cemeteries. Many were memorials. One was a Chieftanship pole. Another a medicine pole. These poles are commonly called totem poles, but are more accurately named crest poles as they feature crests – figures of animals, birds and mythic beings that identify the pole's owner and his moiety or social group, Raven or Eagle. While eagles and ravens are easily identified in nature, carved on a pole they are sometimes harder to recognize. The Old Massett sign features one of each. An eagle on the left, with a sharply curved beak. On the right is a raven, with a straight beak. This detail is from a pair at the end of a soccer field in Old Massett. Outdoor Haida art is not confined to poles. Buildings too are adorned with painted or carved symbols. I found these on community structures, homes and galleries. 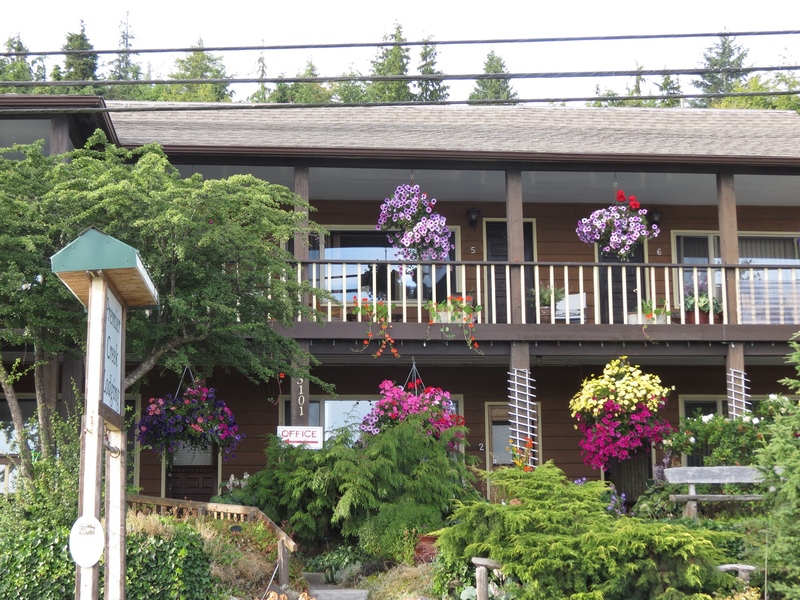 The best source of information and displays of Haida culture is the Haida Heritage Center. 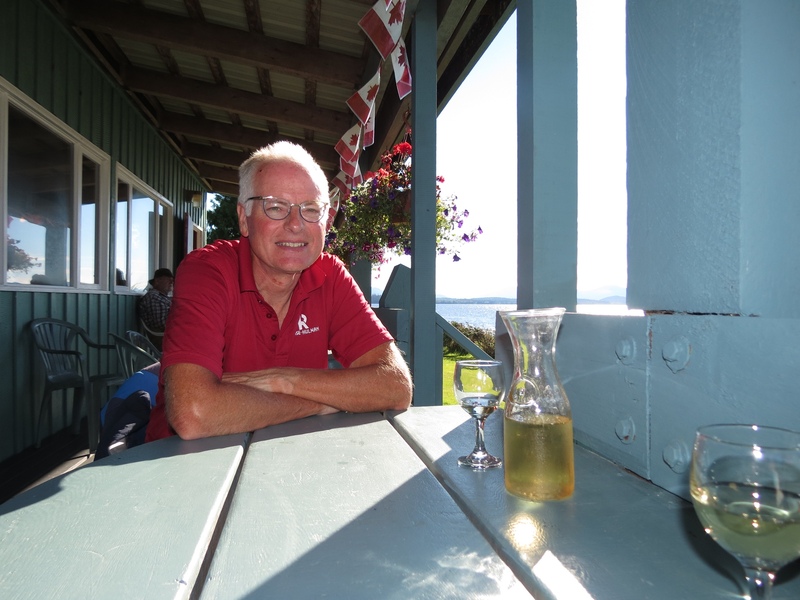 It is an ideal first stop after arriving on the ferry to get a good grounding in the Haida Nation. 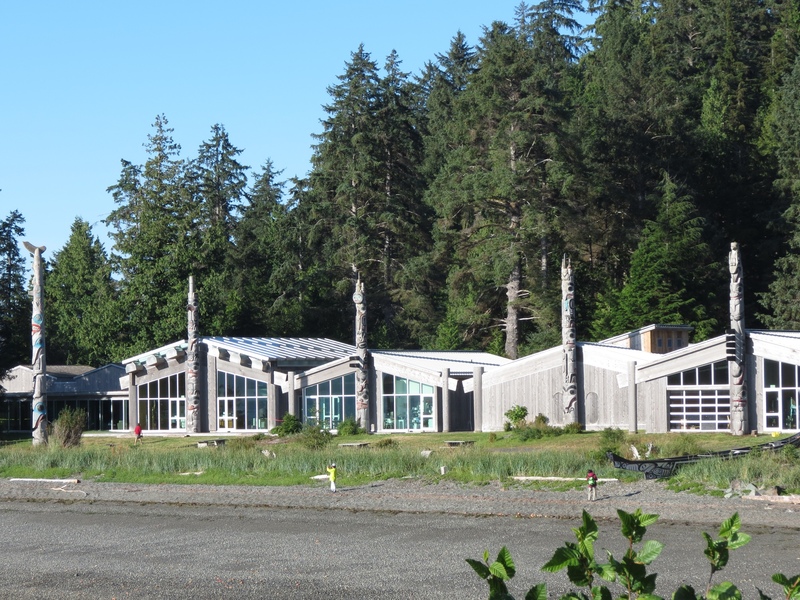 This recently built museum and resource center houses collections of Haida artifacts and detailed displays to preserve and share their history. Its buildings include a carving shed, where I was able to watch a craftsman carving a new totem pole. Seeing its design etched on the log and coming to three-dimensional life under his tools was the highlight of my visit to this center. The ravens and eagles of Haida art were also in abundance live on the island. I've never seen so many bald eagles! It became commonplace to look up and see one flying overhead. Or many. 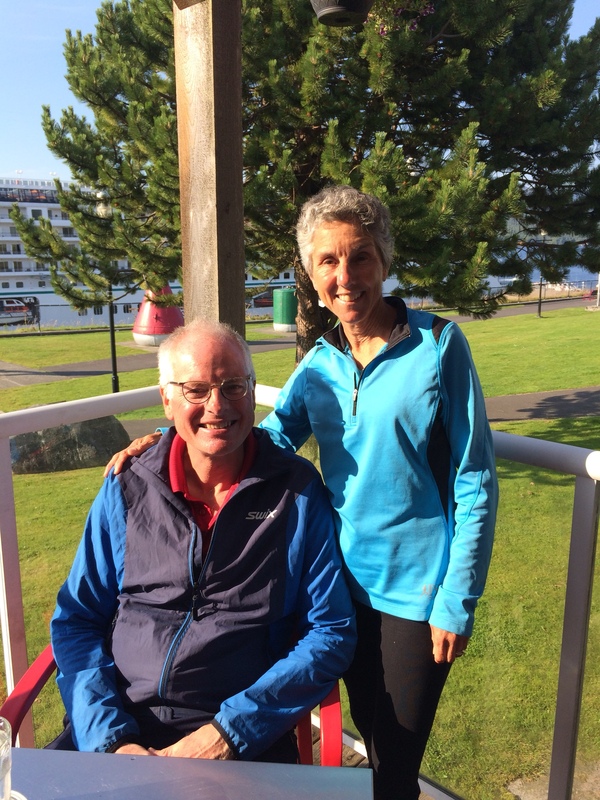 On our first day Rich counted 29 eagles on the 2-mile stretch between the ferry dock and Skidegate. But on our return, it was even better. I stopped on Front Street in Skidegate to inspect a pole. Opposite the houses, in a community grassy area on the water were numerous bald eagles noisily squawking and circling overhead. We soon noticed the nest in a tall dead tree, with eaglets eager to be fed. Rich was in his element. This was bird photography at its best, and he was anxious to capture it. 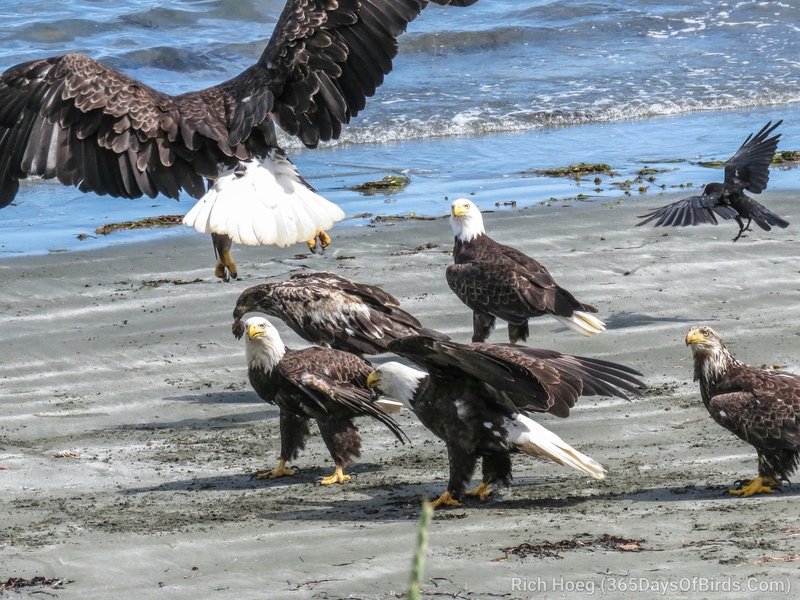 Eagles flew overhead with fish parts, while others approached with talons extended and poised to steal the tasty morsels. 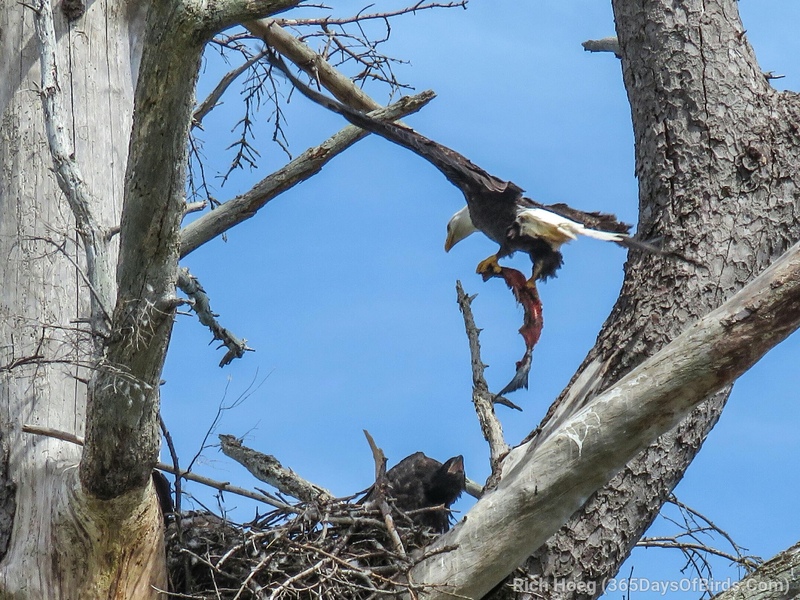 I watched as one eagle parent fought off his competition and successfully delivered his meal to the eaglets in the nest. Ultimately Rich noticed the source of this display and headed over to the action. One of the residents was feeding the birds – no wonder there was such a congregation. Apparently he does so “the same time every day. And the eagles know it.” The ravens joined in the fray as well. We thanked him for the show, and I have Rich to thank for these dramatic photos. It was quite a unique experience, and somehow seemed a fitting way to complete our stay on Haida Gwaii, with the ravens and eagles. 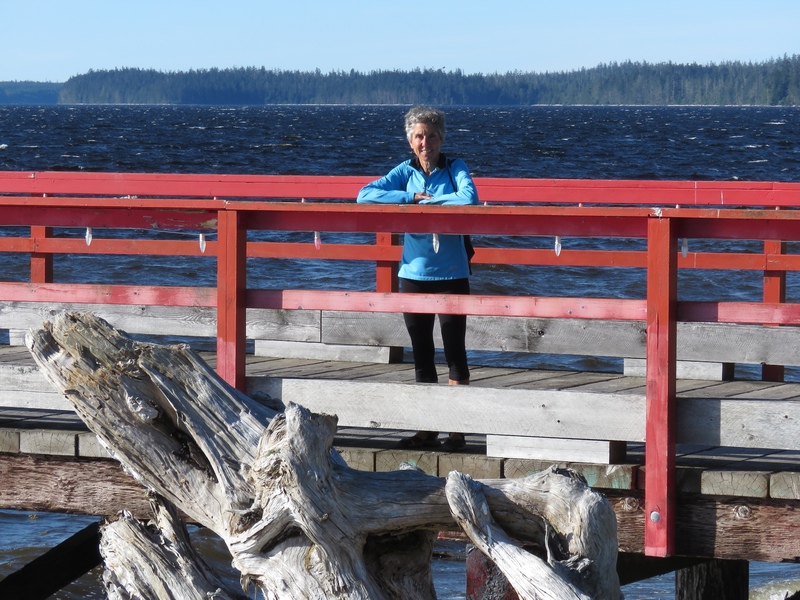 It didn't take long to get into the relaxed mode of life on Haida Gwaii. 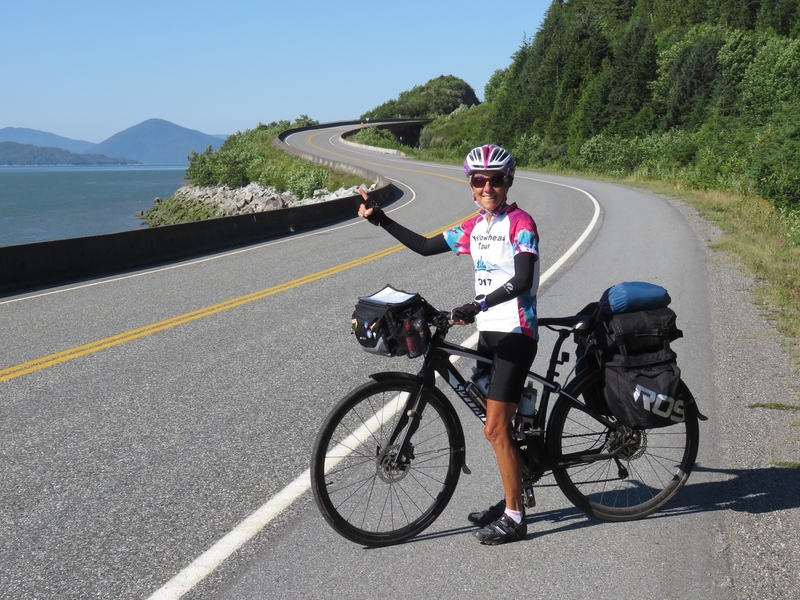 With four days and only 70 some miles of paved roads available, there was no reason to hurry. No need to push on to the next locale. Only time to savor the journey. The mood permeated our days. We stopped more and lingered longer. On the out-and-back trip we found different natural attractions in each direction. Not too surprisingly, water became the common theme. 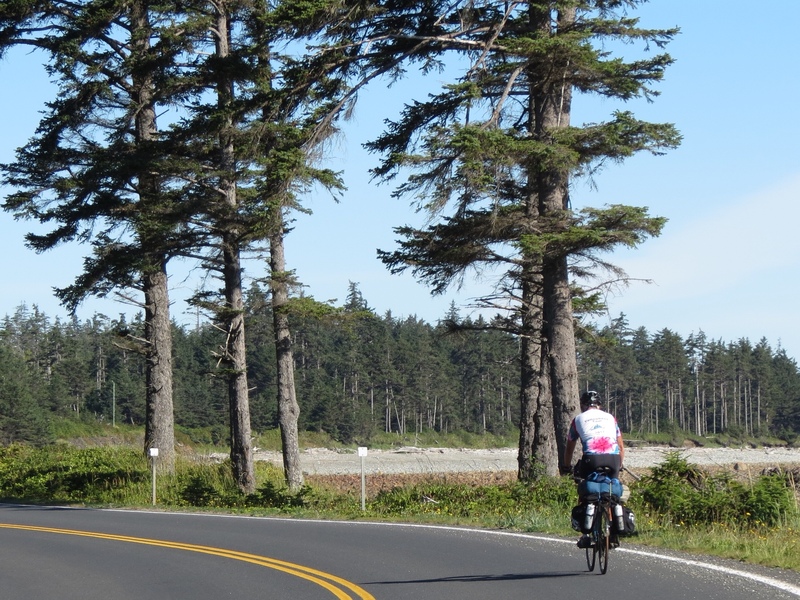 For starters, we had miles of unbroken cycling along the eastern beaches. With the sun pouring down and the tidal pull of blue waters lapping the shore, it was all the scenery I needed. At first, we passed rough and rocky shoreline. Jaggedy dark rocks of medium size covered in calcified barnacles obliterated the sand. The shape of the beachfront changed constantly at the whim of the waves. It looked uninviting to my tender feet. But I admired it from a distance. Biding my time, the beach morphed once again. This time sandy shores beckoned and I called a time-out. The protected spot was quiet and calm. I shed my shoes and socks and the sun-warmed water lapped my feet as I wandered the beach. Near that same beach, the Crow's Nest in Tlell was an unexpected find. What showed up on the map was a Post Office. In reality, it had a bakery, light cafe, organic groceries and espresso drinks! Their still warm sausage rolls in flakey pastry hit the spot, especially as we had anticipated a long stretch before finding food. I lingered luxuriously while horses grazed contentedly in a pasture behind me. Coffee shops are a natural magnet when we are cycling. Not only do I get my latte, but frequently we strike up conversations with locals. It was while sipping my brew one day that I met a friendly couple who answered my question about the rocky and sandy beaches. “They are constantly changing,” they explained. The rocks were thrown up on shore by a large storm. Next week they could be swept away again. The swimming area they currently enjoy at high tide may be gone tomorrow. 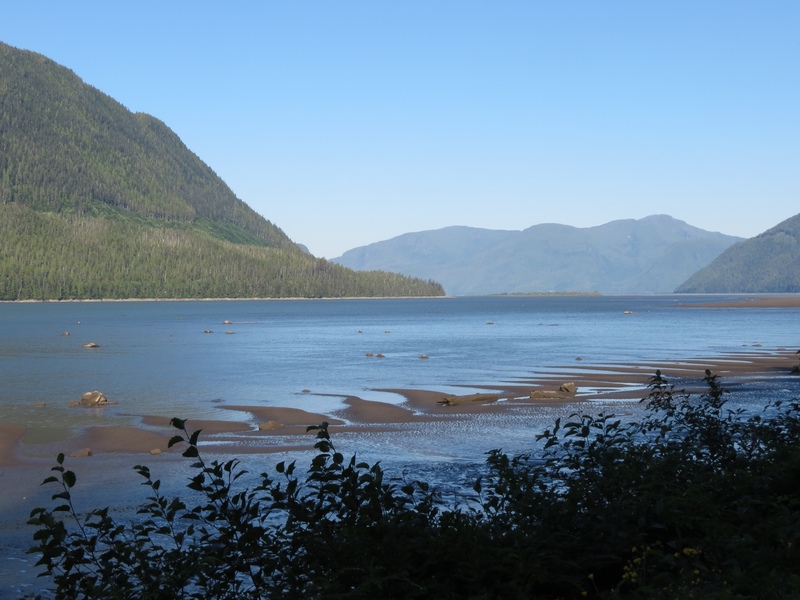 Crossing the island, we reached the Masset Inlet, a long tidal opening reaching down from the northern coast. Overnighting in Port Clements on its shores, we had ample opportunity to meander its shores and dine overlooking its waters. 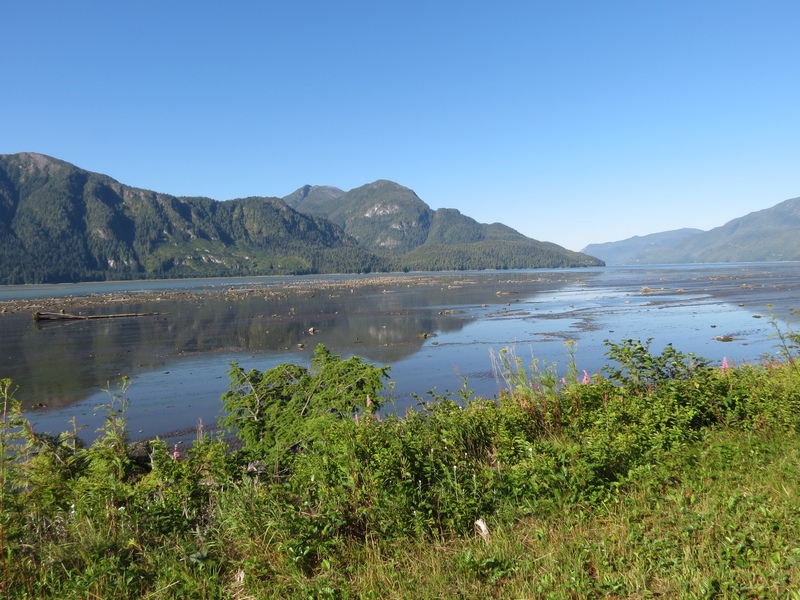 One of the villagers explained to me how she came to be the third generation to relocate to Haida Gwaii. “Groceries are really expensive here because everything has to be brought in,” she admitted. “But there are no other demands on my pocketbook. There are no malls. I walk the beach for entertainment. And there is such strong community here.” She didn't mind being “cut off” from the rest of the world. Neither did we. 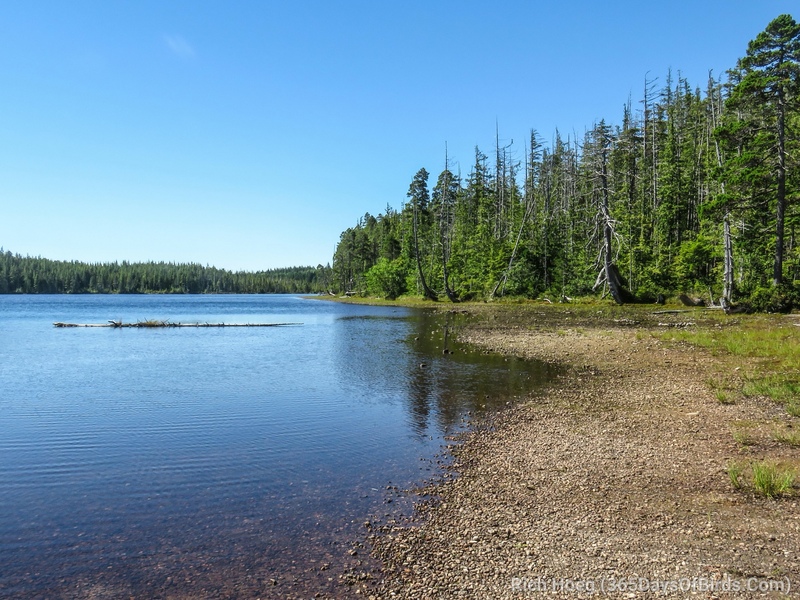 Reaching Masset on the north end, I was especially keen to get to the North Beach and camp there. I also had my heart set on hiking up Tow Hill for its amazing view. 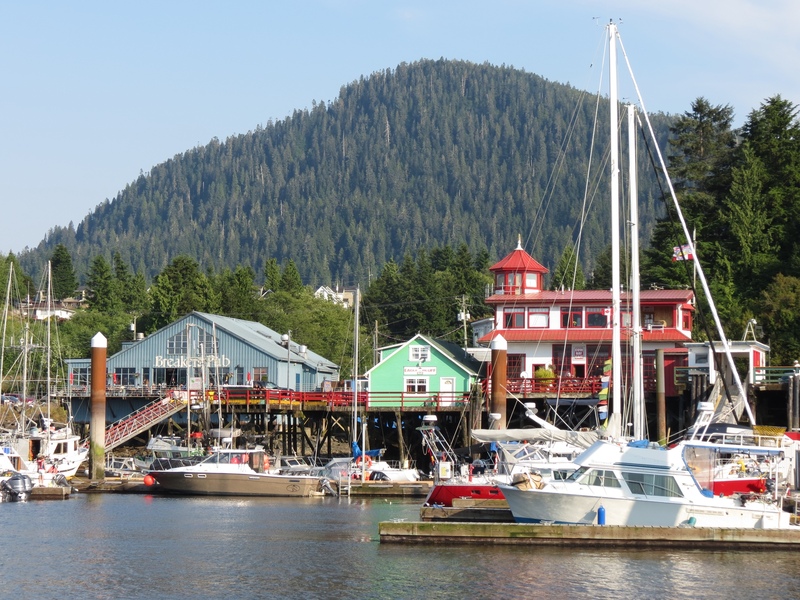 Both are iconic sights on Haida Gwaii. But it wasn't to be. The road out there turned to rough gravel for the final eight miles. It was not bicycle friendly for our touring bikes, so I had to let go of that vision. But I didn't give up entirely. Although most of the coast up to that point was privately owned, I stumbled on an opening. A tiny community park had a trail which I couldn't resist following. Weaving through dark old growth forest, it emerged onto the dunes and beyond lay the beach! The scene before me was entirely different from the east coast. Here was a raging sea. The wind was fierce and waves crashed on a beach strewn with seaweed, shells, rocks and driftwood. I didn't linger long by the water, choosing to retreat to a sheltered spot on the dune where I could observe nature's fury. Although I had blue skies overhead, a low line of fog and clouds rested on the water. 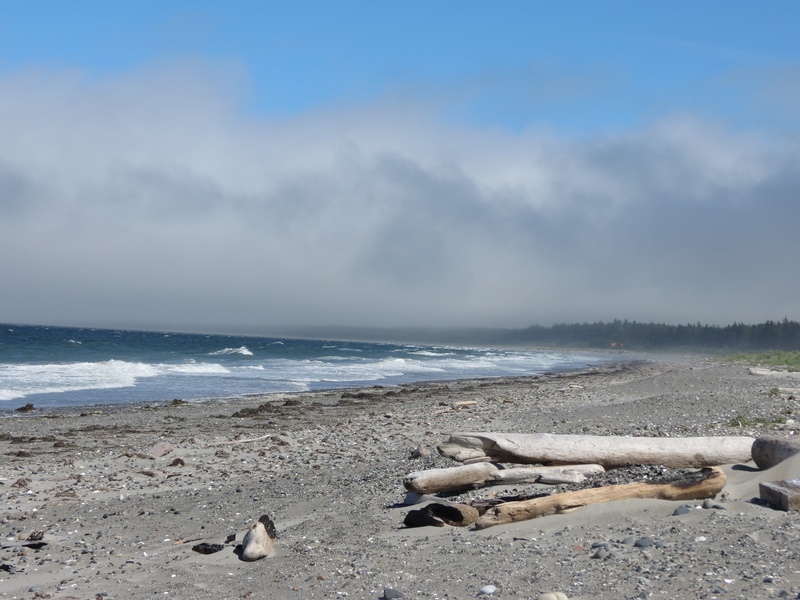 Looking to the far end of the beach, it disappeared into the same fog bank. Tow Hill was nowhere to be seen, cloaked in mist. Perhaps it wasn't the best day for camping after all. That salved my disappointment, slightly. The most refreshing water I found was not salty at all. Pure Lake was just a short hike from the road and offered a small stunningly blue lake. My coffee shop friends had mentioned it was warm and good for swimming. Wading through its clear shallow waters was not enough. I just had to take the plunge! 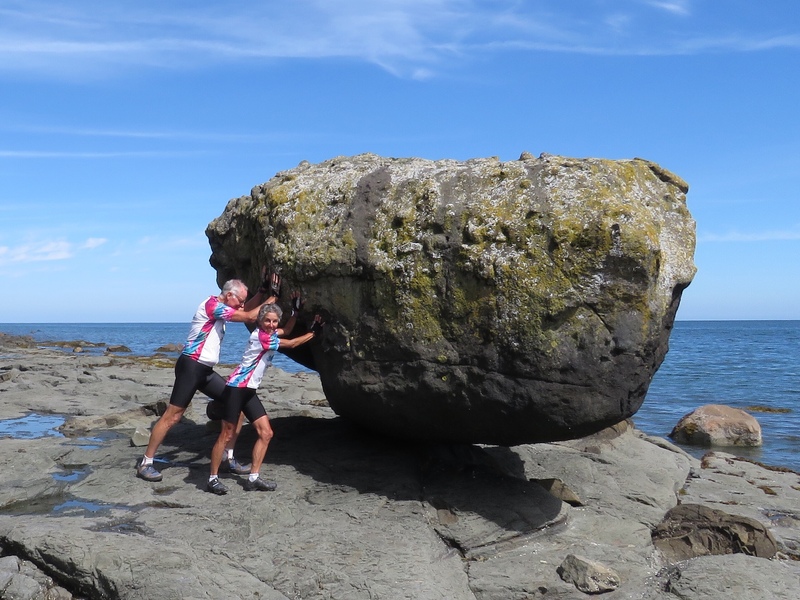 For our final aquatic encounter we sought out Balance Rock. Precariously perched on a logistically minute corner, it hovers over a flat rock bed that reminded me of Lake Superior's North Shore. The last glacial retreat is credited with leaving this van-sized boulder here. 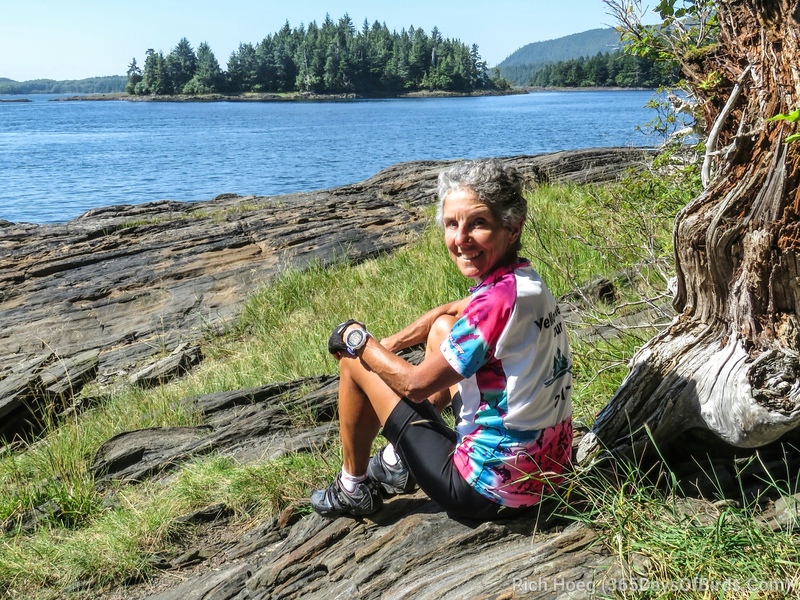 Haida Gwaii offers endless opportunities for outdoor pursuits. 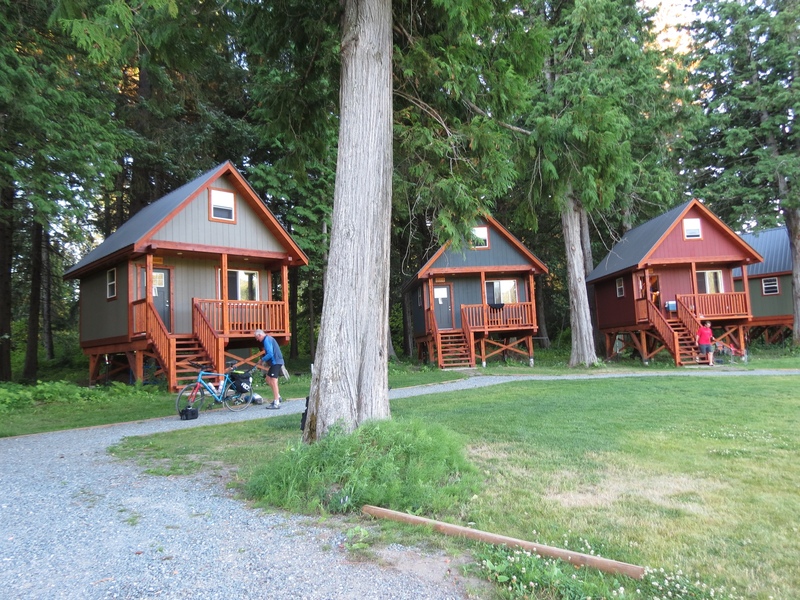 Fishing, hiking, kayaking, surfing, crabbing and back country camping attract enthusiasts of all kinds, although its remote location ensures that it is never crowded. 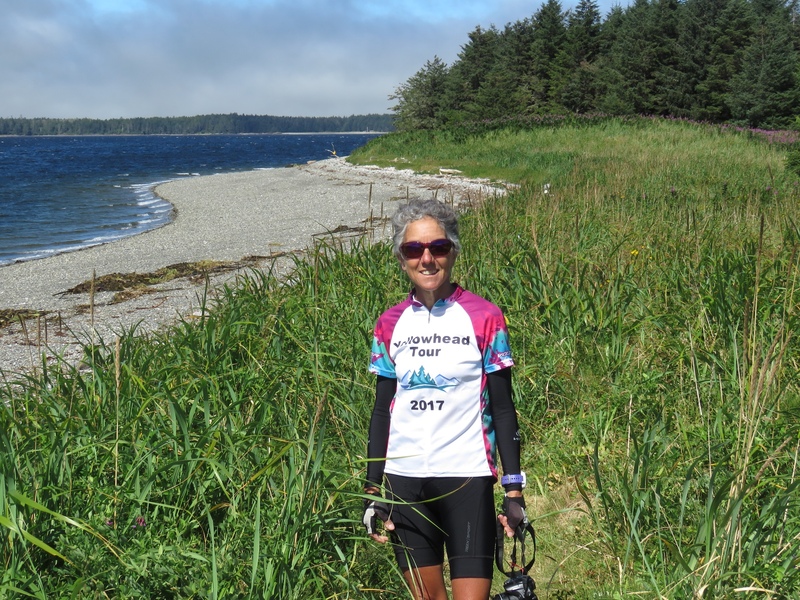 Our four days and bicycle transport limited us from partaking in these other alluring activities, but I think we did justice to the waters of Haida Gwaii. 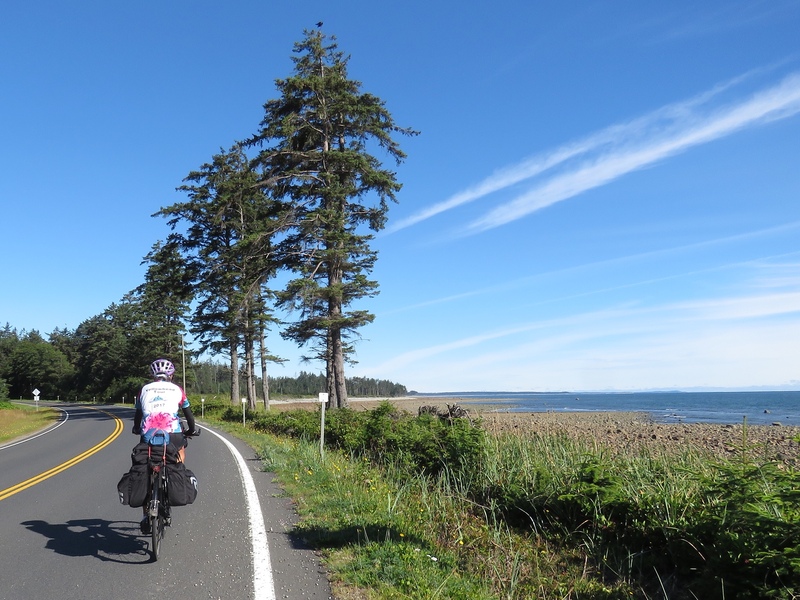 “You're going to love Haida Gwaii.” We heard it over and over again as we cycled through British Columbia. 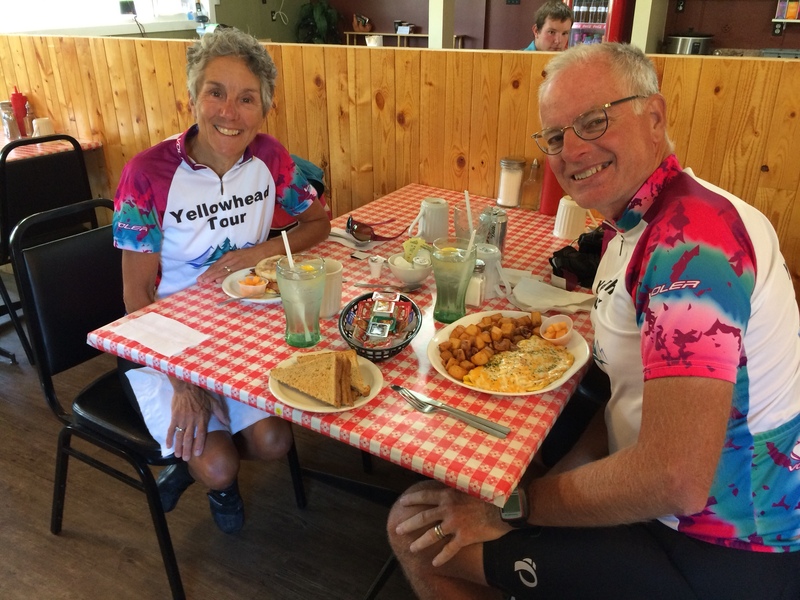 Everyone sang its praises, heightening our anticipation for the finale stretch of our Yellowhead Cycling Tour. Two months ago I'd never heard of the place. While studying our planned route on Google maps, I zoomed in on Prince Rupert and the ferry landing. I thought that was the end of the road for us. 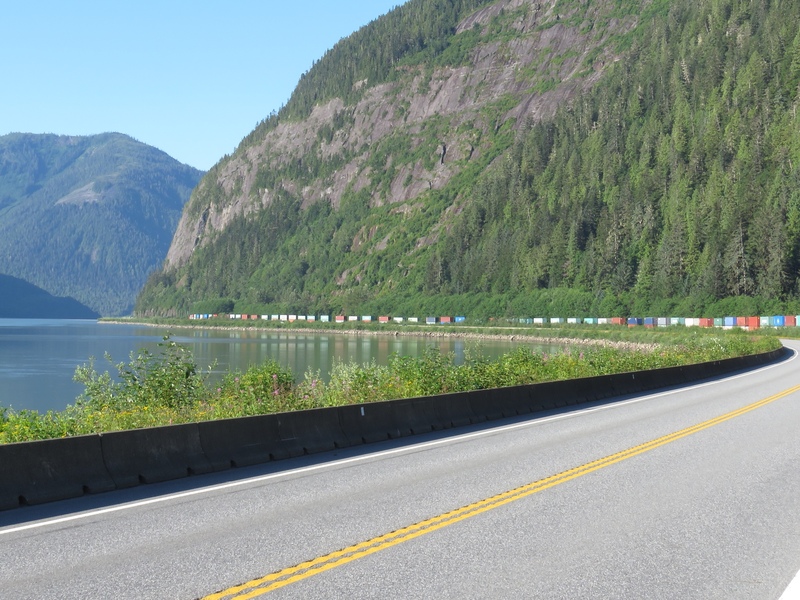 But oddly enough, the Yellowhead Highway continued into the water. Seriously? So I followed the dotted line. 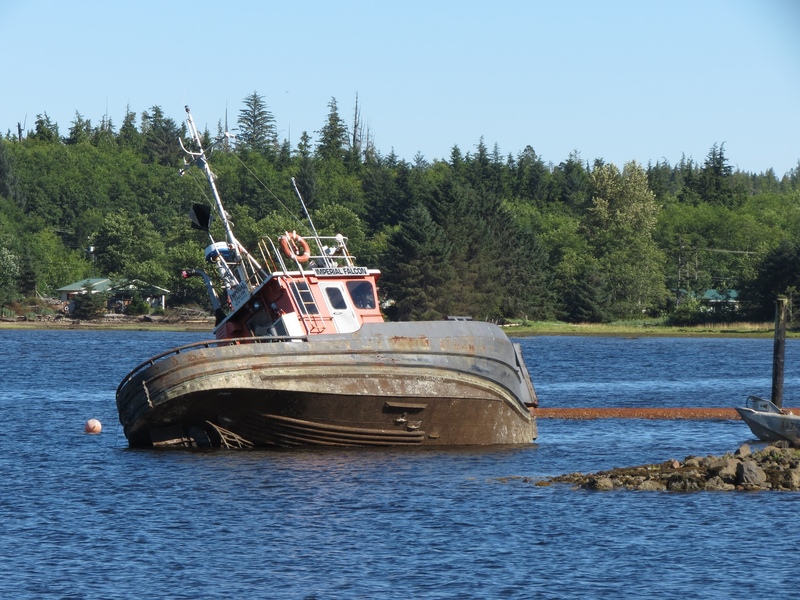 Out, out, out into the ocean it went, and ended on a group of Islands called Haida Gwaii. There the highway continued another 70 miles to its end. Or beginning. Kilometer zero is at the top of the northernmost island. One quick Google search was all it took to convince me. We had to go there. 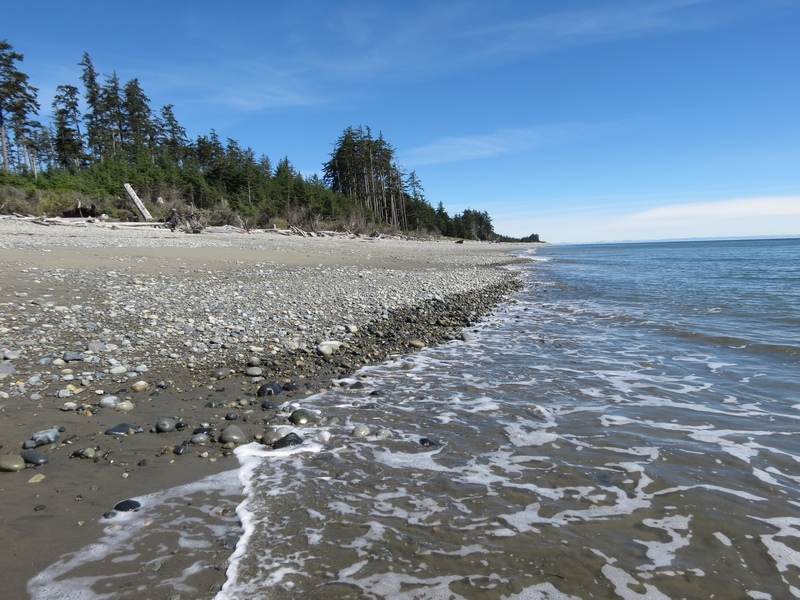 Haida Gwaii is about 60 miles off the coast of mainland British Columbia and is made up of two large islands and over 400 additional islands. 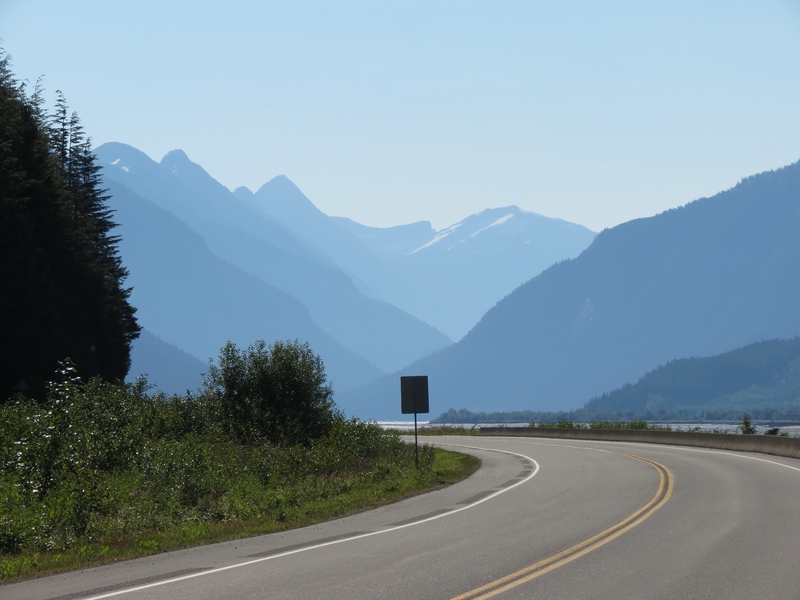 Graham Island to the north hosts six communities and the final stretch of the Yellowhead Highway. 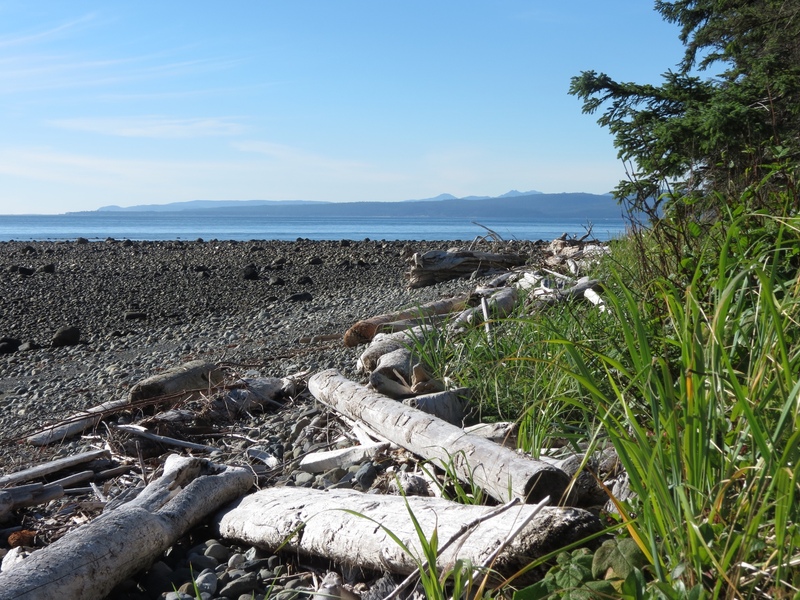 Moresby Island to its south has one community on its north edge. The remainder of the archipelago is wilderness. 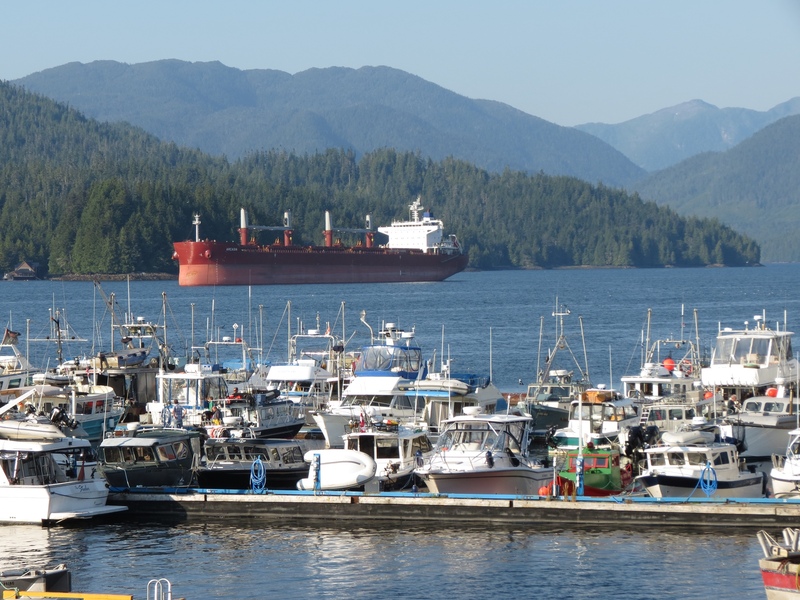 4,500 people live on Haida Gwaii, and about half of those are native Haida people. Theirs is a long and difficult history during which their culture and language were nearly wiped out. Fortunately they have succeeded in reclaiming their heritage which now thrives on these islands. 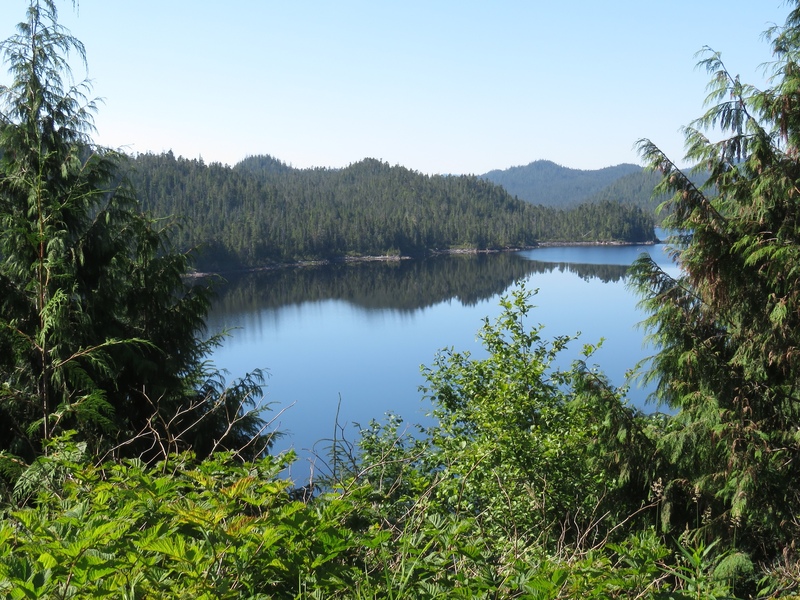 Long known as the Queen Charlotte Islands, in an official Giving Back the Name Ceremony in 2010 the Haida Nation literally returned that name to the Crown to become Haida Gwaii. It means Islands of the People. Logging, fishing and tourism are the primary means of earning a living. And there is a thriving arts community, creating and selling both traditional and modern art based on native designs. This land of wilderness surrounded by water with a passionate native culture and community peaked my interest. 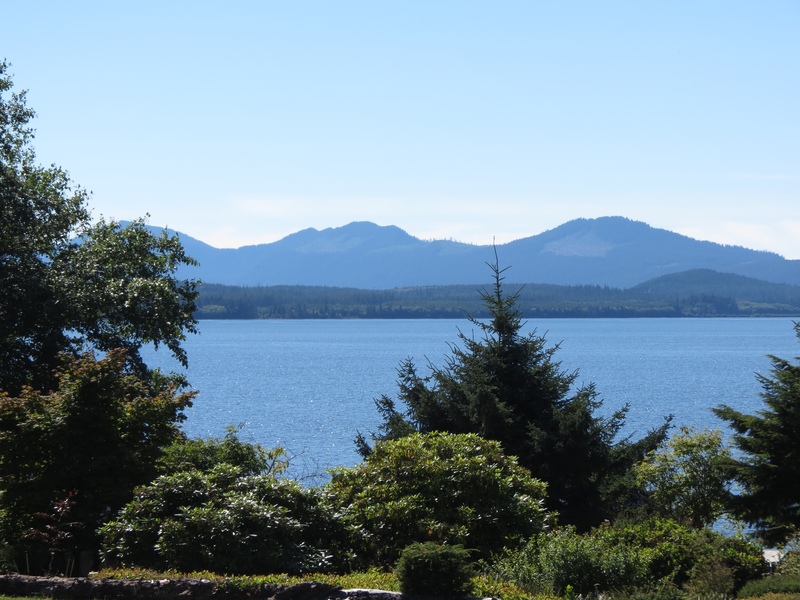 My first views of the island were from the ferry then cycling the few miles to the village of Queen Charlotte. It was a small quiet road that meandered along the calm inlet between the two large islands. The first words that came to mind were lush, green, peaceful and natural. I already sensed the slower pace of life. The focus on the outdoors. And the lack of commercialism. I couldn't wait to explore this intriguing land. We settled into our lodgings which hid behind a veil of flowers. Dinner was on the deck of a small restaurant overlooking the harbor. Boats bobbed in the quiet waters as the sun dipped low. There were no gates to bar us from the docks, so we meandered among the motley collection of fishing and pleasure craft. Moresby beckoned across the water. Morning brought more calm views from our balcony. I should have lingered to soak it up, but I was too anxious to get on my bike to explore the island. 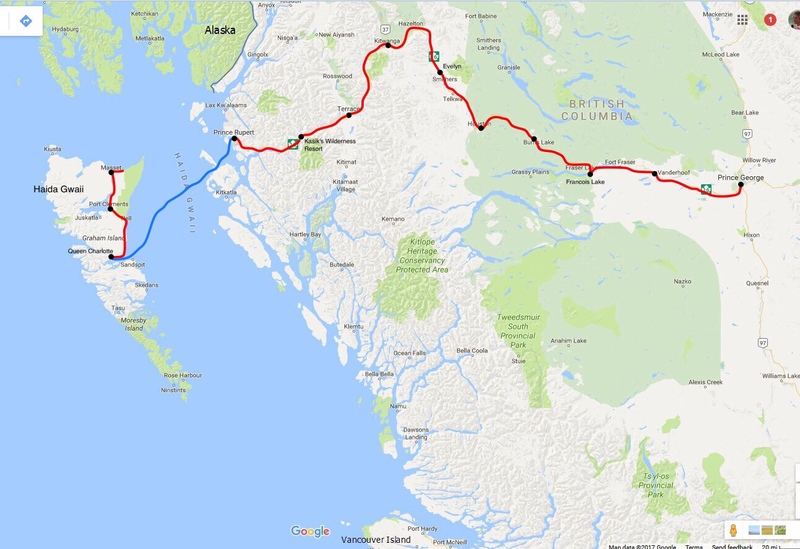 Cycling on Haida Gwaii would take us from the southern end of Graham Island to the north and back again. We had four days of discovery ahead of us. I'd had enough of an introduction. I was ready to experience the real thing. It was a grim sight. The long green building with smeary windows and peeling paint brought only one word to my mind. Creepy. I tried to repress any thoughts about staying there, despite the fact that we had a reservation. We made our way around back where the sign directed us to the office. A doorless shack marked “Landromat” and another unkempt building did little to bolster my confidence. I tried to put my faith in the flowers that adorned the office doorway while Rich rang the bell. It was then we noticed the sign with the little clock – Back at 3:00. An hour hence. Leaving to explore the town, I could contain myself no longer. “It's seen better days,” I ventured cautiously. To which Rich replied, “But it's the only game in town.” A depressing thought. 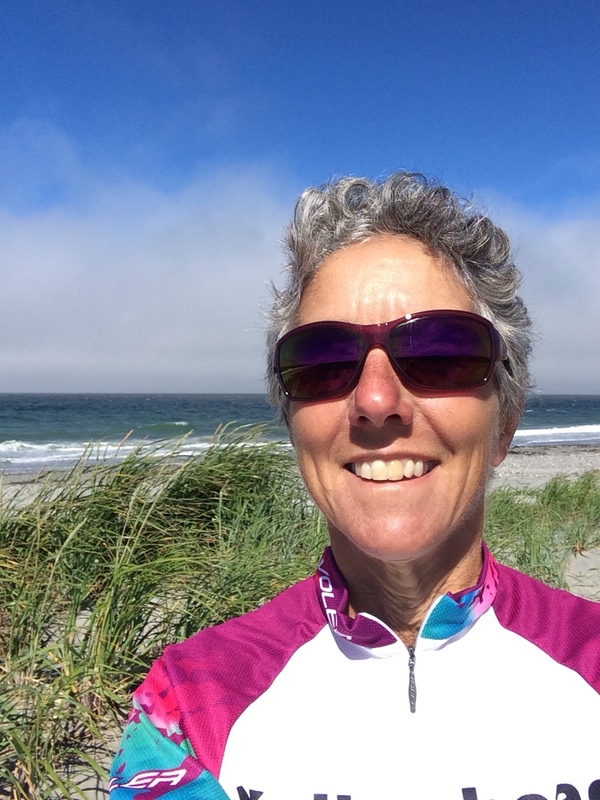 On a cycling tour, moving on to the next town is not an option. I insisted we stop at the Information Center. Inquiring about restaurants, we received more disturbing news. “Just about the whole town has shut down for the holiday,” she informed us. Holiday? BC Day or Civic Holiday as it's known in the rest of Canada. Little matter what it was celebrating, we could be facing a food shortage. Our only hope was the local pub. Approaching the entrance, there was a sign on the door. I was sure it was going to say Closed. Instead, it said Open at 4:00. Hallelujah! We had it made. Or so we thought until the owner came by. She confirmed that they were indeed open that evening, but the cook might not be available. They'd be serving drinks, but perhaps not dinner. Our dismay poured out and she quickly came to our aid. There were a few sub sandwiches in the refrigerator. If all else failed, she promised them to us. We cycled back to the motel under the weight of gloom. At 3:00pm sharp, we heard a cheery voice call out. I allowed myself an ounce of optimism. Soon Diana let us into the office, which was small but neat and recently paneled in light wood. Add several more ounces – enough that I let Rich proceed with checking us in. Diana directed us to a building behind us and suggested we move in our things while she finished the paperwork. Stepping onto a balcony with hanging baskets of flowers facing a freshly mown lawn rimmed with trees, we entered a simple but tidy room with a vaulted wooden ceiling. Relief washed over us. Returning to the office, Diana explained about breakfast. Her Swiss chef was off fishing for the day, but would return in time to serve us breakfast in the room next door. By this time, we no longer raised our eyebrows. We were beyond trying to second guess this place. Our good fortune continued, and the pub's cook also materialized. By this time we were in good with the locals sitting at a long table with the owner. We had plenty of company as we dined. And we met the man who runs the grocery store. “Oh, we would have opened up for you,” he informed us. Morning introduced us to Urs, who was there to prepare our breakfast choices. Since we were his only customers, conversation flowed as freely as the food. And it wasn't long before we gleaned that he really was a trained chef. 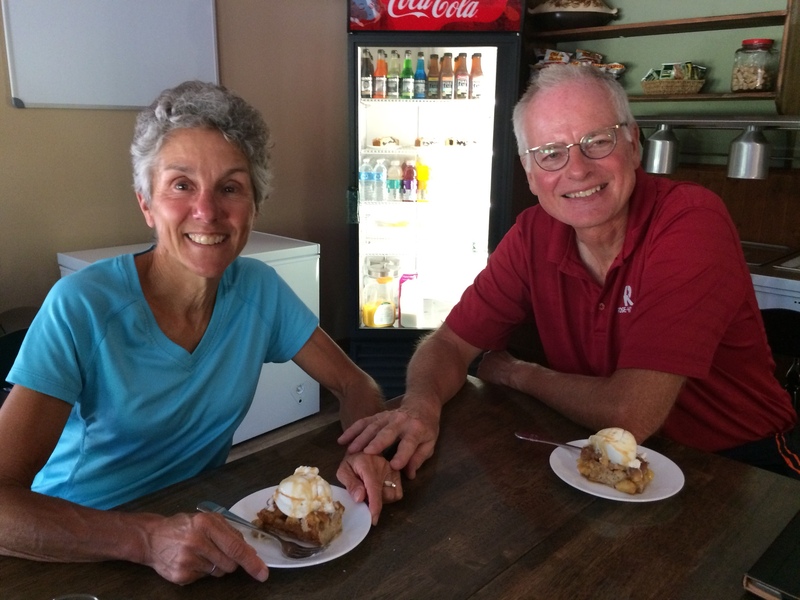 We savored the local flavor as well as our food. Cycling away, we passed the neglected front building that clearly bore the name of the motel. It still gave me the willies. But by then I'd learned my lesson. Not everything is what it seems. And given a chance, the local folk will take care of us. I mustn't be too hasty in my judgement. The sign says it all. Our last 218 miles to the coast are wilderness. Period. I thought our travels were remote for the first portion of our trip. But the last three days have pushed beyond those boundaries. Besides leaving civilization behind, we have also lost most of the traffic on the highway. The bulk of the vehicles likely turned north to Alaska. Better yet, we have had smooth wide shoulders. Cycling doesn’t get much better than this. Towns may in short supply, but scenery is not. We spent one whole day chasing the Seven Sisters peaks. When we first saw them from the train they were shrouded in mist, and only a few of the gals were visible. The conductor told us that it was rare to to have a day clear enough to see all seven peaks at once. This time we had one of those days. Anxious to get a good picture, I constantly scanned the horizon seeking a photogenic view. When the peaks loomed high in the distance, ugly power lines always marred the image. As I moved on, the sisters invariably sank behind the trees. The road twisted frequently and the peaks kept reappearing in new directions, only to repeat their disappearing performance. The next day when we entered the Seven Sisters Provincial Park, I finally got my photo. 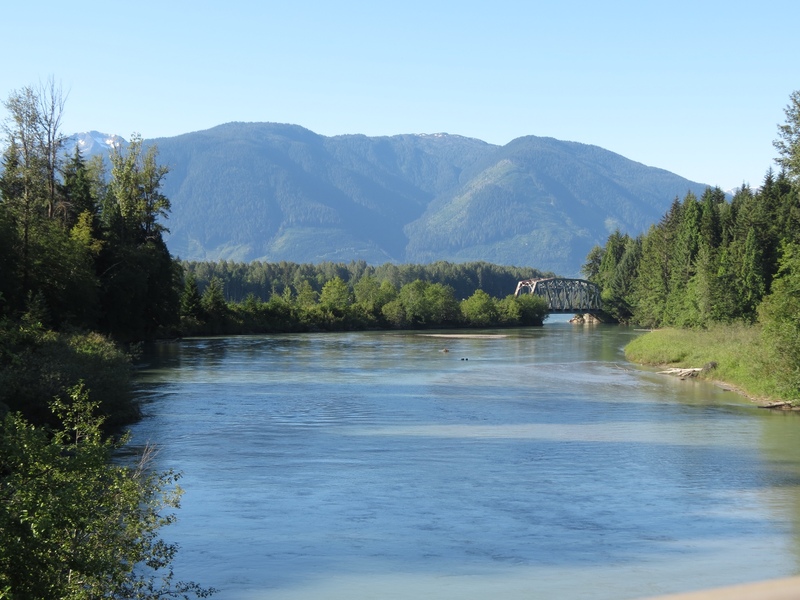 In New Hazelton we joined up with the Skeena River. 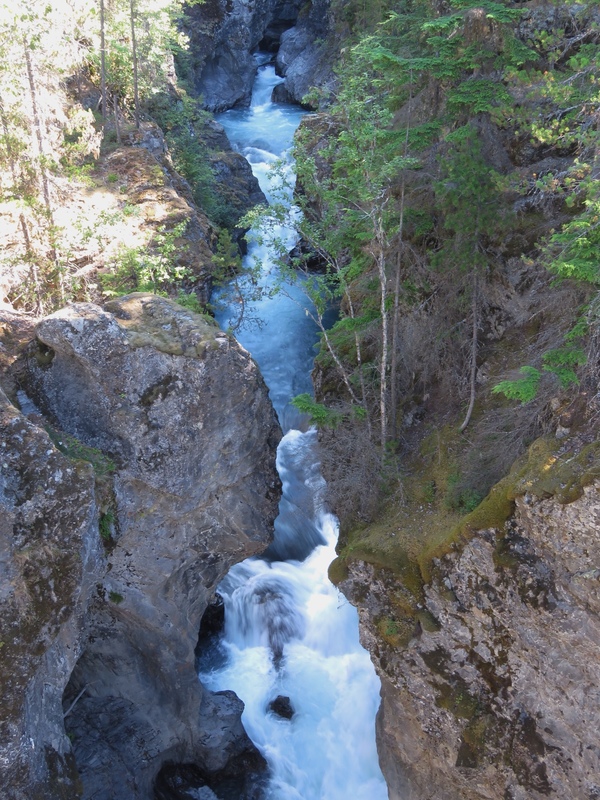 This wide, fast flowing river is one of the longest undammed rivers in the world. It has become our constant companion, and our “ticket to the sea” as Rich puts it. If not for the river, we would not be doing this. 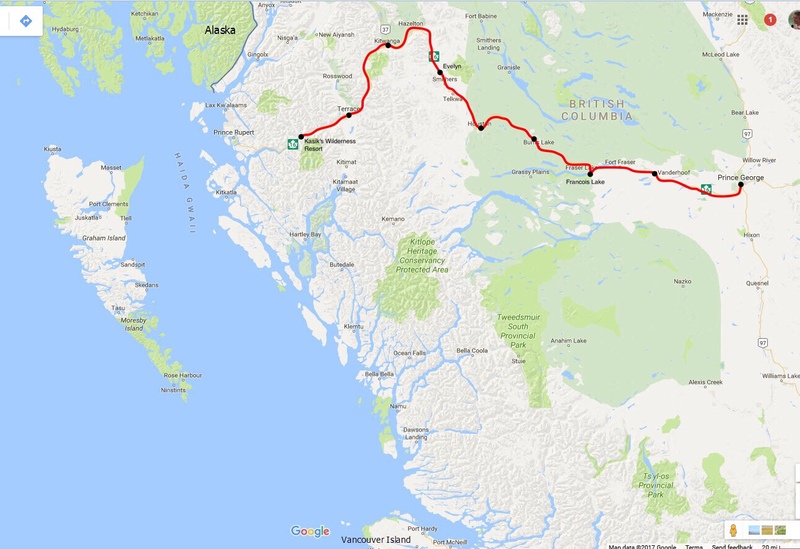 By virtue of the river cutting a swath through the mountains and the Yellowhead Highway following it’s path, we have been granted a very reasonable route to the sea. I was skeptical before we came. But I can now attest to cycling right through the mountains with minimal climbing. 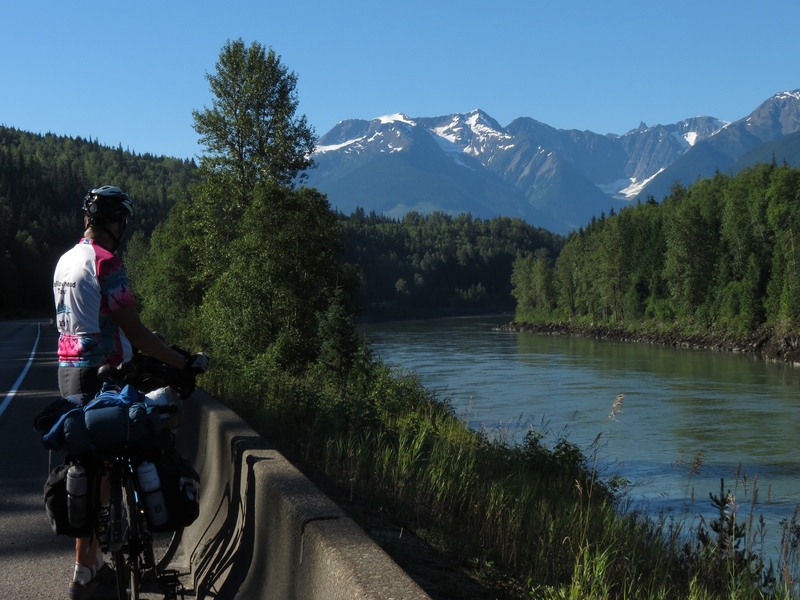 Numerous side rivers and creeks flow into the Skeena, adding to its volume and providing pretty views. Our accommodations on this stretch have required imagination. I have Rich to thank for finding some gems. 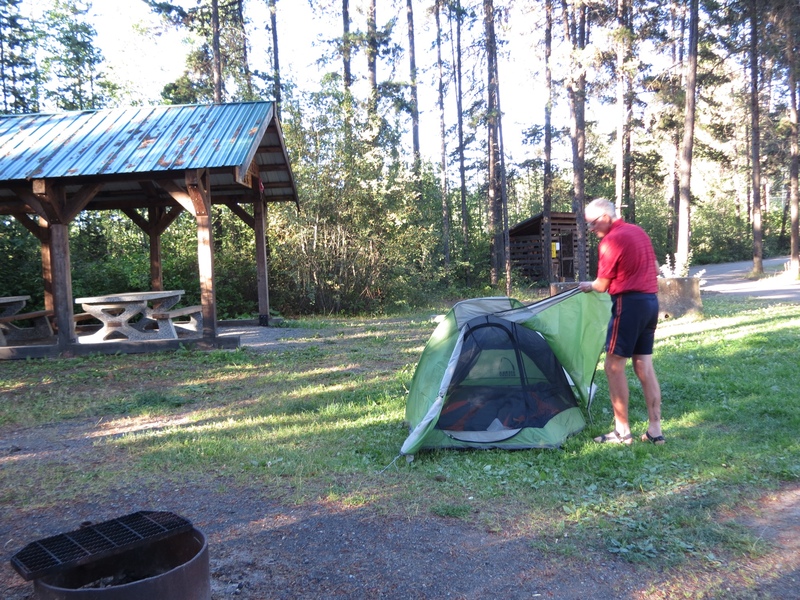 We spent a quiet night in a municipal campground, followed by staying in a treehouse on a farm. Tonight we have a room at Kasik’s Wilderness Lodge. It is the only stopping point in the final 94 miles, which we deemed too far to conquer in a single day. The folks at Kasik’s are have gone out of their way to take care of us. Tonight June prepared a hearty pasta dinner and served up a tasty apple bread pudding a la mode just for us. The biggest surprise of this whole trip has been the weather. We packed for cold and rain, and instead we landed in the midst of a heatwave. Each morning starts out brisk and clear at 50 degrees. As the sun climbs over the mountains the temperature soars, reaching the high 80s by mid-afternoon. To compensate, we start cycling before 7:00 each morning to finish before the height of the heat. The payoff is having consistently blue skies as the backdrop for the wilderness. Tomorrow is our final push to the coast. We already know that will bring cooler temperatures and greater chances of rain. But we can hardly complain. We have had wilderness cycling at its best.